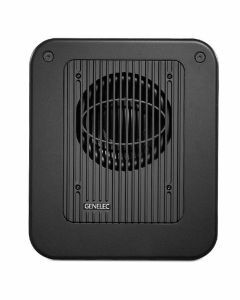 The compact Genelec 7050CPM studio subwoofer is perfect for those demanding a compact subwoofer that delivers extended low frequency performance, generous SPL and professional bass management features. As the newest and most advanced version of the ever-popular 7050 model, the 7050C is the perfect partner for any nearfield monitor, particularly Genelec's own 8010, 8020, 8030 and M030 models. The 7050C boasts a number of improvements over its A and B predecessors, including a bypassable onboard bass management system, lower distortion, a universal mains voltage switched-mode power supply, and an increased maximum SPL of 103 dB. The 7050C is equally comfortable working in stereo or multichannel audio systems, since the bass management section features five input and output channels with 85 Hz low-pass/high-pass filters, plus a discrete 120 Hz LFE signal input with selectable +10 dB boost - bringing it closely in line with Genelec's other professional subwoofers. Measuring just 410 mm in height, with a width of 350 mm and a depth of 319 mm, the 7050C contains a single 205 mm (8 in) magnetically shielded low frequency driver, housed in a Genelec LSE spiral enclosure to deliver extended LF response down to 24 Hz with impressively low distortion. The 7050C also comes with a comprehensive set of rear panel DIP switches to allow the user to adjust subwoofer phase and low frequency roll-off, engage the +10 dB LFE level, and also to activate and control the sensitivity of the Intelligent Signal Sensing (ISS) power-saving mode, which reduces the unit's power consumption down to a mere 0.5 W in standby mode.